/ Gorse lined paths on the Mourne Way. / Following the trail through Rostrevor Forest. / Joining the Mourne Way. / Heading towards Hen Mountain. A wonderful, traffic free day following woodland trails and mountain tracks at the foothills of the mountains. Leaving Rostrevor with a short stroll past the shores of Carlingford Lough you then turn inland to head through Kilbroney Park. The park then gives way to Rostrevor Forest where a wonderfully well maintained trail leads you through, and along the edge of this large forest. It's a popular spot with mountain bikers due to the numerous, purpose built, tracks criss-crossing the land. On leaving the forest you pick up the Mourne Mountain Way which takes you on a much rougher trail heading across open bog land, alongside frothing rivers and over mountain cols. If you're lucky you may share part of the trail with wild ponies that can sometimes be spotted grazing on gorse bushes along the hillsides. The second half of this route follows mountain trails across open, boggy land with river crossings and rocky sections. Pay attention to water levels and find the safest way to cross, even if that means heading off route slightly. As you're crossing land which is very exposed to the elements, with little to no phone signal, make sure you check the weather forecasts here: https://www.metoffice.gov.uk/public/weather/mountain-forecasts/mourne-mountains and listen to any advice the locals may give you before setting out. It's advisable to wear high ankled, waterproof hiking boots as you cross rocky and boggy land for much of the day. Along with the rest of your usual gear for a day outdoors. Remember to pack a wind/waterproof and an extra layer. There is nowhere en route to stop for food or drink so be sure to stock up on any supplies you may need before you leave Rostrevor. 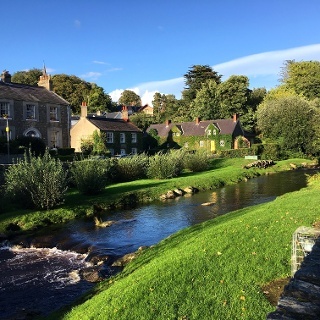 Spanning just over 40km (26 miles) from Rostrevor to Newcastle, you will follow the majority of this off road route which shares it's trails with the St Patrick's Way as it traverses the foothills of the Mourne Mountains. The Mourne Area of Outstanding Natural Beauty is a unique, largely granite landscape shaped by ice and man, with stunning vistas of coast, sea and countryside. If you have time to spare before your transfer at the end of todays walk, you may want to take a short stroll (approx 750m) up the road from your pick up point to Spelga Dam. The dam is clearly visibly as you cross the last bridge over the Upper Bann River. Built in the 1950's it flooded an area known as Deer's Meadow with the plan for the reservoir to supply the counties of Down and Armagh with fresh water. 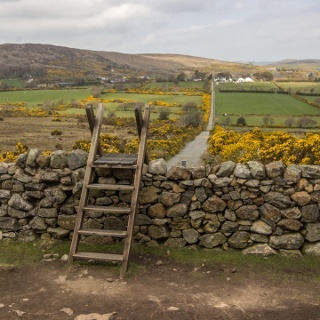 A small road and bridge dating back to the early 1800's used to divide the meadow as it passed between the mountains, connecting Hilltown village on one side of the Mournes with the fishing town of Kilkeel on the other. Although now fully submerged, during particulary dry summers (the last being 2018) the water level can drop low enough to reveal the road to the point it's possible to walk right across it. Main road between Hilltown & Spelga Dam. 0.00 km – Starting at the top of Bridge Street, where you finished yesterday’s walk, go STRAIGHT ON to pass by the Rostrevor Inn then over the river. 0.20 km – Ignore the yellow/blue St Patrick’s Way sign at this point and continue STRAIGHT ON past the entrance to Kilbroney Park. 0.79 km – Now joining the shoreline of Carlingford Lough on your right. 0.91 km – TURN LEFT at the main entrance to Kilbroney Park. 1.30 km – STRAIGHT ON past the junction, following the sign for ‘Forest Drive’. 1.40 km – STRAIGHT ON again at the next junction to cross a small river and continue uphill. 1.50 km – BEAR LEFT at the junction, passing a large gate to then join the paved track through Rostrevor Forest. 1.80 km – BEAR LEFT at the split to stay on the paved track. The yellow/blue ‘Mourne Way’ sign post points the way. 2.60 km – TURN RIGHT to leave the paved track and join the gravel trail heading uphill. 3.80 km – KEEP LEFT at the split in the trail. 4.90 km – Continue STRAIGHT ON at the junction, now following the edge of the forest. 6.70 km – TURN LEFT then IMMEDIATELY RIGHT to cross the metal bridge over the aptly named ‘Yellow Water River’. 6.80 km – TURN LEFT at the opposite side of the bridge then TURN RIGHT after 20m. The St Patrick’s Way signs point you in the right direction. 7.00 km – The trail now cuts through a young spruce plantation. 8.20 km – At the end of the gravel trail, cross the wooden steps to now follow a rough, rocky trail. Keep an eye out for wild horses whilst you cover this next half of the walk. 8.90 km – Cross a small stream then BEAR RIGHT at the sign post to follow the trail around the edge of the small woodland in front of you. 9.10 km – Continue STRAIGHT ON at the opposite side of the woods. 10.30 km – After passing the stone wall, cross the river using stepping-stones. (Take good care here as water levels may vary during or after rainfall.) Then TURN RIGHT onto the gravel track leading uphill. 10.70 km – TURN LEFT to leave the gravel track at the waymarker as you now follow a steeper, grassy/rocky trail. 11.20 km – The trail now levels off as you pass through the col between Rocky Mountain and ………Mountain. 11.60 km – It can be hard to keep to the trail here as it becomes less obvious once heading downhill. If you keep heading STRAIGHT ON towards the river ahead, and pay close attention to the app, you’ll soon pass another St Patrick’s Way marker post. 12.10 km – After crossing very boggy ground, cross the wooden bridge, take care as some sections are broken, then TURN LEFT to follow the trail alongside the river. 12.20 km – Take great care at this point as you cross a wide, rocky section of river. 12.60 km – BEAR RIGHT onto the faint trail heading away from the riverbank. 12.70 km – At the gravel track TURN LEFT to continue towards the rocky peaks of Hen Mountain in the distance. 14.30 km – At the metal gate TURN RIGHT to leave the gravel track and follow the muddy trail, keeping the stone wall close to your left side. 15.20 km – BEAR RIGHT at the marker post to now head away from the stone wall. 15.80 km – Cross a small stream then TURN RIGHT. 16.40 km – After a short, rocky ascent TURN LEFT at the marker post to now traverse the hillside. 17.30 km – After following rocky/boggy ground TURN LEFT to cross the wooden bridge over ‘Upper Bann River’ then BEAR LEFT to follow the track up to the road. 17.50 km – Go through the metal gate then finish your walk here at the roadside. A transfer will now take you on the short trip back to your accommodation in Rostrevor.